A photograph attached to an article in the January 7, 2013 New York Times was a stunner. It wasn’t a Victoria’s Secret model, or a freeze frame of a new Audi, or a close-up of an iPhone 5. It was an aerial view of oil exploration exploitation in its ugliest form: “scorched-earth” exploration of Tar Sands/Oil Sands. In the debate over the efficacy of building a pipeline through the entire United States, from the Canadian border to the Gulf of Mexico, the proponents of the Keystone Pipeline believe the ends justify the means. Rivers, lakes, aquifers be damned. Oil is the only thing that matters. The article in question was titled “Oil Sands Industry in Canada Tied to Higher Carcinogen Level“, and the photograph credited to Todd Korol/Reuters evoked not raw beauty but raw devastation. It was a reminder of the aftermath of the 2004 Sumatra–Andaman earthquake and subsequent Tsunami; of the destruction of Haiti in 2010; of the 2011 post-earthquake photos of northeastern Japan; of mountain-top removals in Appalachia. It was Yucca Flats after the 739 tests (with more than 800 detonations). The last blast was in 1992. Decades after that last blast the area reportedly still looks like a moonscape with craters everywhere. As I said, like Sumatra, Haiti, Japan, Appalachia, Yucca Flat. Extracting oil from Alberta is like those five disasters. Only uglier. The development of Alberta’s oil sands has increased levels of cancer-causing compounds in surrounding lakes well beyond natural levels, Canadian researchers reported in a study released on Monday. And they said the contamination covered a wider area than had previously been believed. In addition to the devastation from capturing the oil from the sands, there is that other pesky thing: Cancer. Most of us suffered through the asinine whoops and chants from the 2008 presidential campaign: “Drill Baby Drill”. The idiocy of those passionate believers hasn’t gone away. They still want to get fossil fuel anywhere, anyway. Environment be damned. Thirty years ago singer Meat Loaf opined that “You’ll never drill for oil on a city street”. He was wrong. In reality, the “Drill Baby Drill” people will dig, drill, blast, destroy: anywhere, anyway, with little or no regard to the environment. The photograph from the Times story brought it all back home. Which brings me to Edvard Munch. When I saw Korol’s photograph it immediately brought my mind back to the classic painting from Munch titled “The Scream”. 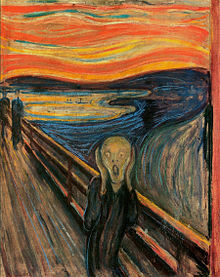 As frightening as Munch’s portrait remains, the image from Alberta is even more frightening. As a society, we can do better. As human beings, we can do better.